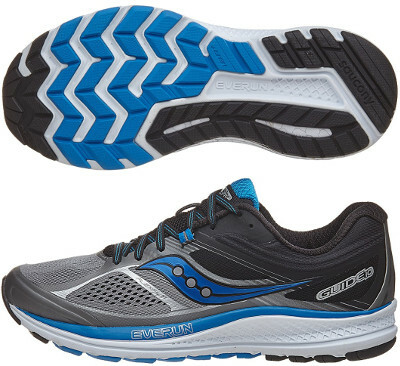 Saucony Guide 10 are stability cushioned running shoes. The Saucony Guide 10 leads innovation again among Saucony collection with current edition. Real users feedback has made Saucony to modify midsole featuring EVERUN to deleiver a more consistent response, something which also affects popular Triumph ISO 3. As a shoe targeting runners looking for mild to moderate pronation control when going for mid/long distances and affordable price, the Guide 10 is placed one step below premium Hurricane ISO 2. As usual in annual updates, upper gets an upgrade from its predecessor Guide 9 with a more open mesh in the forefoot (knit style) for increased breathability. Several FlexFilm™ overlays offer lightweight, seamless feel combined with a modern and attractive look. Interesting that fourth eyelet has been replaced with internal strap (as part of midfoot structure) for a more secure fit using pressure from lace system. The other major change takes place in midsole where specific SRC Impact Zone for shock absorption is now integrated in the more consistent SSL EVA foam midsole piece with typical firmer density in medial post for pronation support. Guide 10 keeps full-length EVERUN topsole layer for plush cushioning. Outsole has reinforced its internal zone which is now firmer while keeps TRI-FLEX configuration for improved flexibility and smoother ride in the forefoot. Materials remain unchanged using lightweight and flexible (IBR+) in the forefoot to enhance cushioning and responsive ride while more durable carbon rubber (XT-900) in more exposed areas to offer reliable traction even on wet paths.